"So the kingdom of heaven is like a king that decided to collect the money that his servants owed him. The king began to collect his money. One servant owed the king several thousand pounds of silver. The servant was not able to pay the money to his master, the king. So the master ordered that everything the servant owned should be sold, even the servant's wife and children. The money would be used to pay the king what the servant owed. But the servant fell on his knees and begged, 'Be patient with me. I will pay you everything I owe.' The master felt sorry for his servant. So the master told the servant he did not have to pay. The master let the servant go free. Have you ever gotten yourself in a hole you couldn't get out of? Most of us have. When we find ourselves in that kind of situation, there is only one solution: grace. We need someone bigger than we are and with more resources than we have to redeem and ransom us from a situation we don't have the ability to salvage. 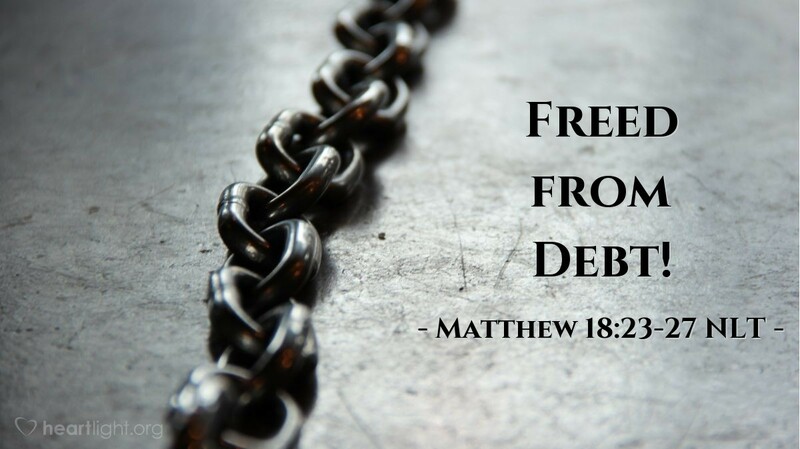 Like the debtor in this parable, we were hopelessly over our heads and deep in debt. We had no resources to repay a small debt, much less the enormous resources needed to pay off the huge debt we owed. God, in Jesus, did it. He forgave us because of his mercy and grace. How can we ever thank him enough? Thanks, dear Father, for your enormous gift of grace that redeemed me and brought me into your family. I will live my life in thanks and praise for your gift. In Jesus' name I pray. Amen.